Russian athletes win 30 medals, including all eight skiing events. 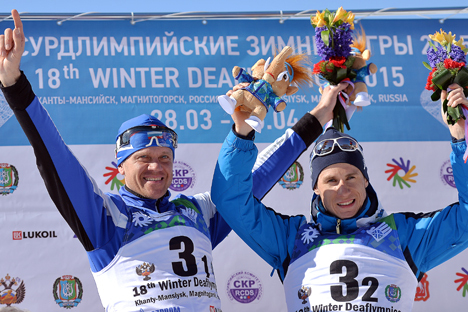 The 18th edition of the Winter Deaflympics ended on April 5 with victory for the Russian national team after it bagged a record number of medals. The competition, one of the world's biggest sporting tournaments for the deaf, was held in two Russian cities - Khanty Mansiisk in Western Siberia (2,600 km from Moscow) and Magnitogorsk in the southern Urals (1,700 km from Moscow). The Russian team won 30 medals in total, including 12 gold, six silver and 12 bronze. The Czechs were runners-up with six golds and one silver, while the U.S. team finished third with three gold, three silver and two bronze. Russia's skiers brought home the lion's share of the team's medals, winning all eight races at the Games. Vladimir Mayorov won four golds, Anna Fedulova picked up three and Alexei Groshev and Sergei Yermilov won two apiece. Snowboarders Maria Kapustkina and Ella Shevlyakova added two more gold medals to the haul, coming in first in the Parallel Giant Slalom and Snowboard Cross, respectively. The Russians also excelled in the team sports, coming away with gold in the hockey and curling events. Russia's hockey players won the final against Canada 6:3 score to notch their first win at the Deaflympics since 1991 (before 2001 the games were known as the International Games for the Deaf). The hockey players dedicated their triumph to the 70th anniversary of the end of WWII. The Russian curling team beat the Chinese 9:5 in their final match. Participants and guests called the 2015 Deaflympics the best in history, said Valery Rukhledev, president of the International Committee of Sport for the Deaf, speaking on the last day of competition. "The whole world has seen how the Games were held and that they were held on a high level. We were very surprised! All the foreign guests and athletes said that Khanty Mansiisk was first among all the Deaflympics because of the quality of the organization of the Games and the sporting venues," said Rukhledev.